SPECIALISTS IN PIGEON LOFTS AND ACCESSORIES.. At Petron we offer pigeon fanciers something very unique - the opportunity to purchase everything for pigeons under one roof. 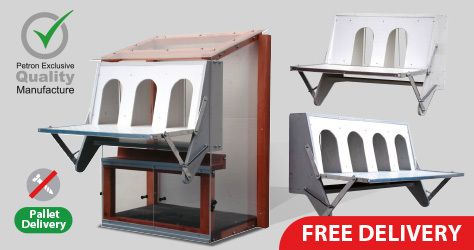 From exclusive pigeon lofts and an extensive range of loft equipment to top quality pigeons, trapping systems and a wide range of healthcare products. We also offer our very own in-house design and personalisation service for gifts and clothing together with our exclusive 'Pigeons with Attitude' range. We provide everything for the pigeon fancier including expert pigeon advice. Our fully equipped manufacturing workshops and mail order distribution warehouse cater for your every pigeon need. This together with our excellent customer service ensure complete peace of mind when purchasing from Petron. Our friendly sales team will be happy to offer expert advice and assistance on any of our products. You can be assured that your enquiry will be dealt with in a professional and efficient manner from order to delivery.